Blackjack Comparison - How Does Blackjack Stack up to Other Games? Blackjack is among the most popular casino games in the United Kingdom. In our Blackjack comparison, we tell you why the game continues to gain prominence over other casino games. The game fundamentally requires skill, with experienced players having the upper hand over starters. For a player to win in the game, they have to beat the dealer. A player can have a maximum of 21 highest value hands, with hands that exceed a value of 22 landing an automatic lose, also known as going “bust.” Players are allowed to stand when their hand value crosses the hard 17th mark while dealers must stand when their value dips to the 17th mark. 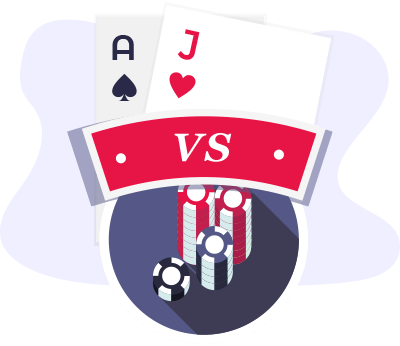 Below, we compare Blackjack with Roulette, Baccarat, Craps, Slots, and Bingo to establish their differences and similarities. In Blackjack, a player to can make smart decisions to influence the house edge while the Roulette, has a fixed edge. The Blackjack hand has some decisions points. A player can up their house edge by a 100% through hitting any available hand until they bust. The “basic strategy” is used to guide a player in deciding every situation. It provides the best mathematical play and can be easily memorised. Players also use the wagers per hour on a table to find out whether to play Blackjack or Roulette. In Roulette, when a player has four opponents, they can only see 35 spins in an hour. It is easy for a player to estimate their average loss per hour when placing one wager in every spin. On the other hand, when playing Blackjack with four opponents, a player expects 60 hands in every hour. If the player is using the basic strategy, they can be prepared to lose one nickel per hand which translates to $3 per hour. This results in low entertainment cost per hour besides doubling the hourly amount of money placed on a bet. Unlike in Blackjack where concentration and strategy are a must, in Baccarat, a player can bet on a banker or another player. The ability of a player to make independent decisions without relying on a dealer is one of the reasons that influence whether a player chooses to play Blackjack or Baccarat casino games. Baccarat is an easy game to play since a player can make decisions without relying on a dealer. This makes the game a favourite among new players compared to Blackjack. Due to this simplicity, there are fewer chances of a player making mistakes which enhances the casino experience of a new player. New players can encounter challenges when playing Blackjack online. The simplicity of playing is a significant determinant among players when deciding to play Blackjack or Craps. While Craps requires minimal skills to play, Blackjack requires excellent skill on the part of a player. It is easy to comprehend the basic rules of playing since all a player has to learn is which bets minimise the house edge to win in the semi-finals. Players who are consistent in placing bets are assured of a win. When playing Blackjack, a player has to stick to the primary strategy for guidance on whether to stand, double their cards, or split based on their last move and an analysis of the present situation. Additionally, players have to stick with the selected strategy and take into account the pair of starting cards to enhance the efficiency of the remaining cards in securing them a win. For a player to win a blackjack game, one is required to beat the dealer by having two cards, whose value is equal to 21. 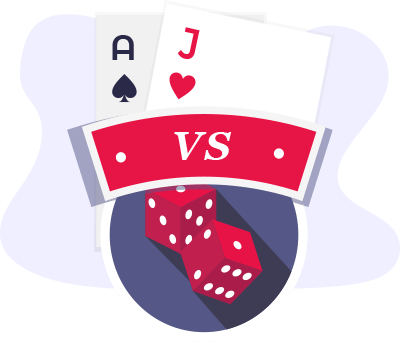 The player who beats the dealer first has an advantage in the game. Little strategy is required since speed is the player’s ultimate winning combination to put him ahead of the rest. Playtime is a significant consideration to players when deciding to play Blackjack or Poker. With blackjack, it takes little time before a player can win in a game since hitting the 21 is equivalent to securing a win. It is also possible to repeatedly hit the 21 in a single sitting, which gives an experienced player the opportunity to register several wins in a night. However, a player can only win once in a poker session depending on how frequent they get the best hand. Failure to get the best hand leads to the elimination of a player. The level of decision making required during play is among the primary considerations to be made by a player when choosing whether to play Blackjack or Slots. In Blackjack, a player is required to make up their mind on whether to hit or stand for every hand they are dealt. Further, a player will at times be required to decide on whether to surrender, split, or double down when on the losing end. On the contrary, when playing slots, a player can continue with the game without having any strategy and wait to emerge a winner through luck. All that a player has to do is decide on the number of lines and the amount they want to place on a bet and spin the button from time to time. Blackjack players can only win a maximum of one and a half the amount placed on their bet on one hand. However, playing slots, a player can win thousands on a single spin. Players consider some aspects of the game when deciding to play Blackjack or Slots Blackjack or Bingo. Bingo is a stress-free game since players do not have to master the frequency of the numbers. Players only require concentration at the end of the game’s phases which is a rather short time. Playing Blackjack, on the other hand, requires a well-formulated strategy to guarantee the final victory. Secondly, online bingo game can be easily learned, unlike Blackjack whose mastery require longer time. 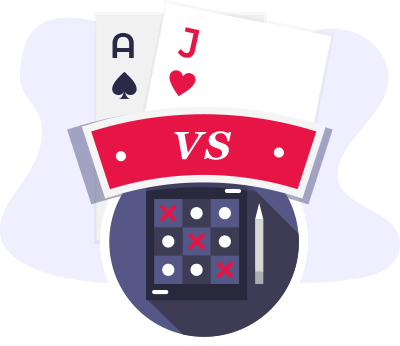 Thirdly, winning when playing Bingo is out of sheer luck, unlike playing Blackjack which requires a player to fully memorise the table and basic strategy which is quite tedious. Additionally, it takes time before a player can know how to count cards. Bingo wins are dependent on luck, and little effort is required to learn a strategy. Finally, Blackjack players have a multiple of options including Double, Tripple, or Spanish Blackjack, unlike in Bingo which only has one variant.